Mountain biodiversity provides billions of people with vital ecosystem services and sources of livelihoods. Mountain Research and Development is looking for papers that present validated insights into ways of managing mountain (agro)biodiversity so that it contributes to human wellbeing; that analyze interlinkages between mountain biodiversity, global change, ecosystems, and people; or that offer evidence-informed agendas for research or policymaking. The deadline for abstracts has been extended to 22 April! The registration for the 2019 African ESP conference on the Management of Ecosystem Services for Nature Conservation and Human Wellbeing in Africa is open. In 10 sessions, and several keynotes, delegates will discuss the role of ecosystems services (or Nature’s Contributions to People) in nature conservation, landscape restoration and sustainable management in Africa. The conference will take place in Kpalimé, Togo, 17-20 June 2019. To complete its team, the Institute of Earth Surface Dynamic of the Faculty of Geosciences and Environment, University of Lausanne (Switzerland) invites applications for a PhD position in spatial planning for biodiversity conservation. Mountain biodiversity provides billions of people with vital ecosystem services and sources of livelihoods. Mountain Research and Development is looking for papers that present validated insights into ways of managing mountain (agro)biodiversity so that it contributes to human wellbeing; that analyze interlinkages between mountain biodiversity, global change, ecosystems, and people; or that offer evidence-informed agendas for research or policymaking. Abstracts are due by 30 March 2019, full papers by 16 August 2019. Submissions of high-quality chapters (each between 10 and 20 pages) focusing on changing mountain environments in response to climate change and/or land use change are invited. The book is designed as an interdisciplinary publication which critically evaluates developments in mountains of the world with contributions from both social and natural sciences. Manuscripts may include empirical research, literature reviews, and evaluations of previously published research papers of single scholars or working groups. Deadline for expressions of interest: 15.02.2019. The VULPES project of the Belmont Forum has collaborated in organizing the upcoming International Conference on Past Plant Diversity, Climate Change and Mountain Conservation that will be held in Ecuador, 11-15 March 2019. This international conference aims to evaluate the impact of climate change on mountain species, including analyses of montane systems globally and at scales ranging from communities to the gene. Deadline for abstract submission: 05.02.2019. The University of Geneva and GRID-Geneva are proud to announce the third edition of the Certificate of Advanced Studies (CAS) called «Geomatics for a Sustainable Environment». This CAS aims at providing attendees with a good understanding and practical skills on the various open source geographic and environmental tools together with approaches to tackle environmental challenges and sustainability. GMBA database search tool: online in beta version! An important role for GMBA is to connect mountain biodiversity scientists. For that purpose, we have developed an online tool for the query of our database of members. The beta version is now online! Check it out! International Mountain Conference 2019: call for abstract is open! The Mountain Partnership's new Indigenous Mountain Peoples Database is online! Mountain communities are undergoing rapid sociocultural change, caused by drivers such as outmigration, urbanization, and increasing insertion into the market economy. Mountain cultural heritage is under threat. But communities are responding in creative ways. How can we ensure that culture is a source of creativity and empowerment, that it constitutes the roots upon which a global ethics can grow, and that it helps bridge the divides between the individual and the communitarian? Mountain Research and Development is looking for papers that address these questions and others. Notices of intent are due by 30 September 2018, full papers by 1 February 2019. The World Mountain Forum (WMF) aims at providing a timely space for policy-makers, scientists, and practitioners to share experiences and best practices, and develop integrated solutions to existing challenges to sustainable development in mountain regions. The WMF 2018 programme includes high-level segments for leaders and dignitaries, plenary and keynote presentations, debate panels, parallel sessions on four core thematic issues (outlined below), and field trips. Click on this news to get to the programme draft and submit your contribution by 29.07.2018! The Mountain Sentinels collaborative network (mountainsentinels.org) is working to understand the most important activities and the most significant barriers to success common across collaborative research projects worldwide. They developed a survey to gather insights from both researchers and practitioners with collaborative experience across all systems (not just mountains). Click on this news to take the survey! A postdoc position is opened in Spatial ecology & Biogeography in my ECOSPAT group at the University of Lausanne, to be started on 1st November 2018. Application deadline is June 30th. The candidate is expected to have very good skills in modelling and spatial analyses with R. Click on this news item to find out more about this position. For three weeks in 2017, Michele Menegon and his colleagues explored the Kabobo massif, discovering an unprecedented biodiversity. Click on this news to follow them along the way up one of the most spectacular and pristine massif of the Democratic Republic of the Congo. GMBA launches its mountain biodiversity and human wellbeing survey! GMBA is carrying out a first coarse assessment of the state of, trends in, and relations between biodiversity, ecosystem services, human wellbeing, and direct drivers in the world's mountains. Please click here to take our survey and share your knowledge about the mountain social-ecological system(s) you are working on! It will take you roughly 40 minutes to answer the questions and share the survey link with your colleagues scientists, policy-makers, and practitioners. We thank you for your contribution and are looking forward to receiving your answers by 31.05.2018! The Afromontane Research Unit (ARU) and Department of Plant Sciences at the University of the Free State (UFS)’s Qwaqwa Campus, in association with various invasion research partners, is advertising for a PhD Candidate to work on the invasion ecology of the South American Tussock Grasses (Nassella) in southern Africa. Application deadline is May 15th. Click on this news item to find out more about this position. The Science for Nature and People Partnership (SNAPP) is seeking proposals for interdisciplinary teams to develop evidence-based solutions to challenges at the intersection of nature conservation, sustainable development, and human well-being, using a synthesis research approach. The deadline is June 6th, 2018. More details can be found in the Request for Proposals by clicking on this news item. Robert Mills at Lancaster University is making the first global assessment of the response of alpine soil microbial communities to perturbations associated with climate extremes, using proximate controls (e.g. microhabitat, microbial community structure, soil organic matter quality, vegetation structure) as well as broader-scale controls (e.g. bioclimatic zone, geological attributes) to explain variance. All he needs are soil samples from mountain regions. If you are interested in participating, click on this news for more information. The call for abstracts for Mountains 2018, to be held from 10 to 14 December 2018 in Nova Friburgo, Brazil, is open. Mountains 2018 will be organized along two segments: the III Workshop on Sustainable Development in Mountain Environments on 10-12 December; and the II International Conference on Research for Sustainable Development in Mountain Regions on 12-14 December. The deadline for abstract submissions is 31 May 2018. Click on the news to learn more about the conference. The Inter-American Institute for Global Change Research (IAI) opened a call for pre-proposals on the role of ecosystem services in adaptation to global change for human wellbeing. The IAI will fund international collaborative research networks for 2 years. Click on the news to read more about the call. Deadline for submission is 27.05.2018. MIREN (the Mountain Invasion Research Network) is calling on mountain scientists to join their global Trail Survey this summer! The aim is to study the spread of global plant invaders along mountain trails to figure out where and how fast these species are traveling. Participation is easy: just walk a mountain trail and use your GPS or smartphone to submit observations of the plant species of interest. Click on this news to get more information and contact MIREN if you are interested to participate: miren.trails@gmail.com. Mountain Futures Conference 2018: SUBMIT YOUR ABSTRACT! The second Mountain Futures Conference will take place in China’s Yunnan province, against the backdrop of the famous Hani rice terraces in Honghe and the rapidly growing city of Kunming. Abstract submission is still open until 23.03! Don't miss this fantastic opportunity to shape the future of the Mountain Futures Initiative and to share knowledge and ideas with a range of researchers and representatives from mountain regions around the world. For late comers, please contact the organizers: limingjiulijiu@gmail.com! The University of Geneva and GRID-Geneva are proud to announce the second edition of the Certificate of Advanced Studies (CAS) called «Geomatics for a Sustainable Environment». This CAS aims at providing attendees with an overview of the various existing tools and approaches to tackle the multidisciplinary environmental challenges. 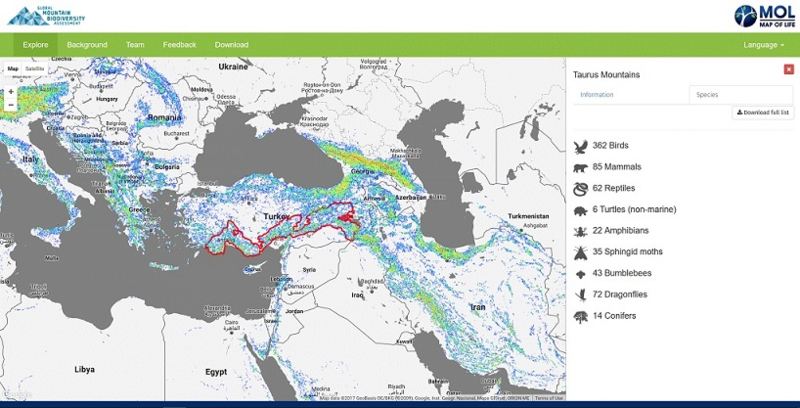 The first module is a MOOC about ecosystem services, followed by a second module presenting different tools linked to Spatial Data Infrastructures, Web Mapping, statistics and programming, as well as specific thematic tools and approaches commonly used to address issues in biodiversity, ecosystem services or water resources. Under the initiative and leadership of GMBA network member and University of Lausanne research associate Dr. Christophe Randin, 120,000 plants from the Canton de Vaud are currently being digitized at the botanical garden in Lausanne. A tremendous effort to make samples collected since 1800 available to the scientific community at large but also, and importantly, to the broader public, who will be able to query these data online by the end of the year. As the curator of the garden, Christophe has been preparing this gigantic project for several years, raising funds and awareness about the importance of such work. GMBA Scientific Steering Committee member Walter Jetz (Yale University, Map of Life) and his PhD student Ignacio Quintero apply the GMBA mountain inventory to look at global elevational diversity and diversification of birds and show that a worldwide mid-elevation peak in bird richness is driven by wide-ranging species and disappears when using a subsampling procedure that ensures even species representation in space and facilitates evolutionary interpretation. Im Zeichen der Forschungsförderung und des Dialogs Wissenschaft–Politik engagieren sich die SCNAT und die Akademie der Geistes- und Sozialwissenschaften (SAGW) im Bereich der Schutzgebiets- und Gebirgsforschung, der sich zukünftig thematisch um Fragen der Landschaftsentwicklung erweitern soll. Im Zentrum stehen Beiträge zur Koordination der Forschungsinstitutionen, zur internationalen Zusammenarbeit, zur Verbindung von Forschung und Praxis, zur Aufarbeitung des Stands des Wissens sowie zu dessen Vulgarisierung und Vermittlung in die Politik und interessierte Öffentlichkeit. Die SCNAT sucht per 1. 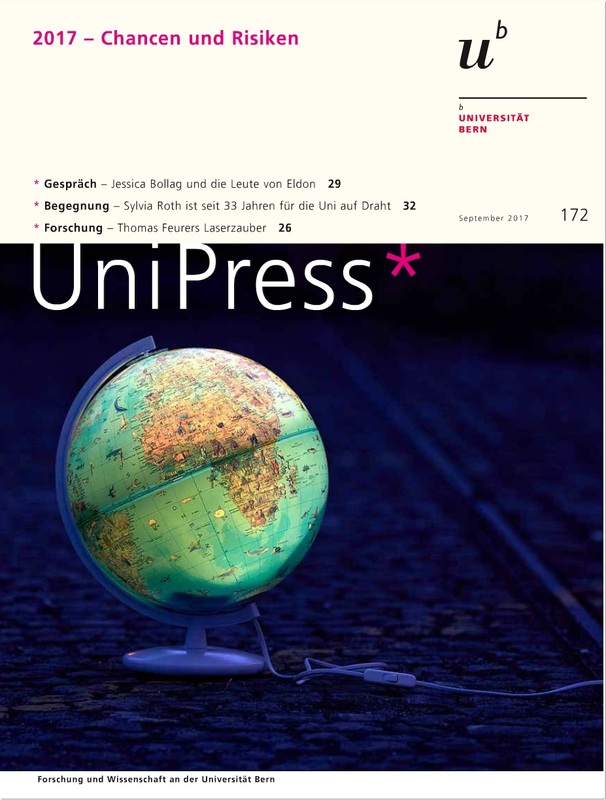 September 2018 oder nach Vereinbarung eine/n wissenschaftlich ausgewiesene/n Leiter/in Schutzgebiets-, Gebirgs- und Landschaftsforschung (80-100%). This special issue that coincides with the 250th anniversary of Humboldt's birth, will review the current state of knowledge of biodiversity and geodiversity around the world, and draw lessons for biogeography from understanding linkages between biodiversity and geodiversity. Papers may present new data, reflect on the state of affairs, or review a particular geographic region. Extended abstracts are due by 31 March 2018, full papers by 30 November 2018. The Global Mountain Biodiversity Assessment, the ESA GlobDiversity consortium, and the bioDISCOVERY and Global Land Programme of Future Earth concluded a successful three-day workshop on the present and future of remote sensing for biodiversity monitoring and the modeling of species distributions. The Global Mountain Biodiversity Assessment, the ESA GlobDiversity consortium, and the bioDISCOVERY and Global Land Programme of Future Earth jointly organize a workshop on the use of remote sensing in biodiversity assessment, University of Zurich (Irchel campus), 05-09.02.2018. All podium presentations delivered during the workshop are open to the public. The program on Monday will focus on the use of remote sensing for informing species distribution models and the program of Wednesday will focus on the use of remote sensing for informing essential biodiversity variables. Click on the news to get the flyer! Martin Luther University Halle-Wittenberg and its partners in Germany and Chinar are jointly starting the new International Research Training Group TreeDì - Tree Diversity Interactions: The role of tree-tree interactions in local neighborhoods in Chinese subtropical forests (www.treedi.de). TreeDì offers 18 positions for doctoral researchers, 9 on the German and 9 on the Chinese side. These projects will be addressing synergistically how tree-tree interactions in local neighborhoods translate into tree species richness effects on ecosystem functions at the community scale. The International Center for Integrated Mountain Development in Kathmandu (ICIMOD) is looking for one Knowledge Management and Communication Officer (Chinese language), one administrative associate, and one Enterprise Resource Planning associate. Vacancies are announced on the ICIMOD website. This focus issue on implications of out- and in-migration for sustainable development in mountains offers papers on asylum seekers, amenity migrants, young in-migrants, depopulation, the elderly, the structurally poor, and resettled migrants; they analyze social, environmental, and economic impacts of migration in mountains in Europe, Chile, Georgia, Nepal, Kyrgyzstan, Tibet, and Ethiopia. Further topics are vegetation, wildfire observation, and hydro-sociology. Mountains and mountain communities are critically affected by climate change. Mountain Research and Development (MRD) is looking for papers that assess novel adaptation practices and present well-researched insights into implications of climate change relevant to adaptation. Synthesis papers comparing case studies are of particular interest, as MRD aims to contribute to the IPCC’s 6th Assessment Report as well as to inform development policies. Extended abstracts are due by 19 January 2018, full papers by 15 August 2018. The International Center for Integrated Mountain Development in Kathmandu (ICIMOD) is looking for one Remote Sensing Specialist and one Geospatial Information Technology (GIT) Specialist (based in Afghanistan). Vacancies are announced on the ICIMOD website. Food security is a key concern for sustainable development in mountain areas. Mountain Research and Development is looking for papers that present validated insights into development solutions for reducing malnutrition and increasing food security for mountain people; that analyze food systems in mountains against the background of global trends and the need for conserving ecosystems; or that offer agendas for research or policymaking aimed at increasing the sustainability of food systems in mountains. Notices of intent are due by 15 November 2017, full papers by 28 February 2018. This Focus Issue assesses the role of mountain forests in relation to the UN Sustainable Development Goals. After an Introductory Essay, papers cover gender issues in agroforestry (Ethiopia) and community forests (Nepal), small-scale mountain farm forestry (Austria), rubber and the rural economy (China), a throughfall-exclusion experiment (Bhutan), mountain forest resilience (India), Andean forest landscape research, US federal forest productivity, rangeland property rights (Bhutan), and urban spatial growth modelling (China). 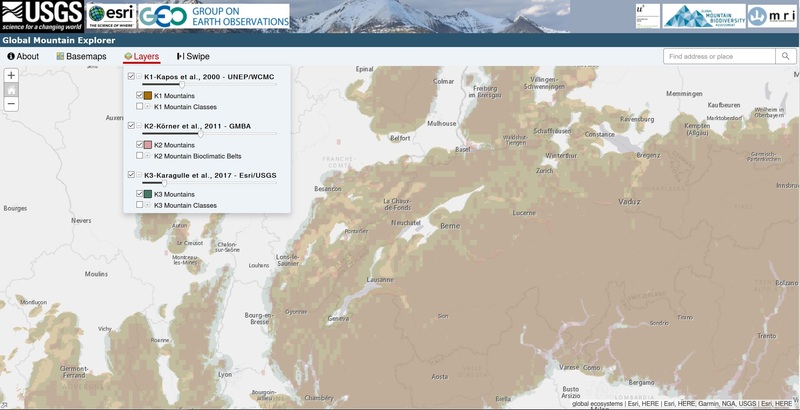 The Global Mountain Biodiversity Assessment (GMBA) and Map of Life (MOL) launch the Mountain Portal V2.0, now with more data and an improved user experience to the mountain biodiversity science community. A video of the Future Earth Natural Assets Definition Workshop held in Bern, 12-13 September 2017 is now available online. GMBA and PI Markus Fischer were awarded one of the five highly competitive one-year research grants of the Program for Early-stage Grants Advancing Sustainability Science (PEGASuS) jointly managed by Future Earth and Colorado State University's Global Biodiversity Center. PEGASuS seeks to bring together researchers from different scientific disciplines to explore areas critical to the health of humans and the planet. The GMBA project entitled “Toward biodiversity-related opportunities for sustainable development: a global social-ecological mountain comparison” is a social-ecological research project that will compare mountain ranges all over the world to identify regionally adequate opportunities for sustainable development related to mountain biodiversity. 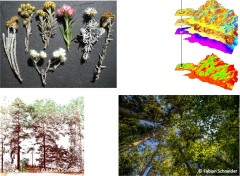 In a recent publication in Perspectives in Plant Ecology, Evolution and Systematics, Christian Körner and Erika Hiltbrunner from the University of Basel remind us of the challenges of selecting the appropriate measure of temperature for an ecologically meaningful description of habitat conditions and for a mechanistic understanding of responses of plants. As the authors explain, the difficulty becomes even greater at elevations above the climatic tree limit, where plant stature, topography, and seasonal snow cover interact in producing temperature conditions that largely deviate from weather station records. Articles in MRD often relate to the climate change debate at the core of the IPCC process currently gearing up for the 6th Assessment Report. Two papers in this open issue offer contrasting positions: one is critical and advocates a stronger local perspective (on mismanagement of irrigation water and landslips in Pakistan), the other uses the global perspective to discover patterns (in a review of climate change impacts on ecosystem services). Other papers deal with maize diversity and poverty reduction in Guatemala, offer a new approach to assessing tap water recharge in Japan, present a method for measuring bark biomass in Nepal, and assess the habitat ecology of a profitable but endemic resource in Tibet. This book co-edited by Christian Körner and Eva Spehn among others presents the first assessment of the high-elevation flora of the Central Caucasus with a community ecology emphasis. Following a geostatistical-climatological description of the region, it describes the montane, alpine and nival plant assemblages on the basis of an ecological approach that combines moisture, soils, and local habitat peculiarities. The book offers a unique guide to the plant species diversity of this mountain range, and a valuable resource for comparative ecology and biodiversity assessments of warm temperate mountain systems. In this study Steinwandter and colleagues take a look at soil invertebrates and at their community composition in managed and abandoned alpine pasturelands in Austria, 14 years after a first assessment. Results show clear shifts and increased diversity after abandonment and contribute to improving the currently limited understanding of spatio-temporal biodiversity patterns of Alpine soil communities. As part of its continuing education program, the University of Geneva proposes a new Certificate of Advanced Studies (CAS) called «Geomatics for a Sustainable Environment» in English. The instructor-led teachings will take place as a Geneva summer school from 4 to 15 September 2017. Several tools, thematics and hands-on exercises covering GIS, Remote Sensing, Spatial Data Infrastructures, Geoprocessing, Geostatistics, Species Distribution Modeling, Soil and Water Assessment as well as Ecosystem Services Assessment will be presented, giving attendees an expertise or consolidated knowledge in geomatics and environmental fields. A study is being carried out by the University of Lausanne on the conservation of alpine plants in botanic gardens. If you have alpine plants in your collection and would be interested in collaborating in the study, join in! In this study, Seimon and co-authors report results from over an decade of monitoring of three anuran species in the Cordillera Vilcanota in southern Peru, their habitat, and their Batrachochytrium dendrobatidis (Bd) infection status. Despite the rapid and dynamic changes in habitat under a warming climate, continued presence of Bd in the environment for over a decade, and a reduction in one of three anuran species, Seimon et al. document that these anurans continue to breed and survive in this high Andean environment. The publication is available in open access. Alpandino (https://www.alpandino.org) is an e-learning course on alpine ecology developed by the University of Basel. The course contains lectures on various aspects of alpine ecology, including climate, microclimate, water issues, and soils, and also offers a photo-excursion to alpine habitats and treeline locations around the globe. This course is a great entry point for a diverse audience, ranging from alpine zoologists and microbiologists to conservation experts and nature reserve managers. It serves also as an ideal preparation for field excursions or field weeks with students.